The lake where the phone was found is about seven miles from Smith's apartment, where Parker dropped off the twins at 3:18 p.m. that day. About 4:30 p.m., Smith dropped off the children at his parents' house, about 10 miles from his home. About the same time, Parker's brother said he got a text from her phone saying she might be in Waterford Lakes area, about eight miles from where her Hummer was found the next day. Smith's attorney, Mark Nejame, told NBC affiliate WESH-TV that such a timeline makes it impossible that his client was involved in Parker's disappearance. Police told the Orlando Sentinel that the iPhone was discovered in "remarkably good condition" and that several photos were pulled by investigators. The phone was found beneath the Nela Avenue bridge across Lake Conway, which is in the Belle Isle area just north of Orlando International Airport. Police did not say when the phone was found. Investigators said the iPhone last gave off a "ping" about 8 p.m. Nov. 17 from that area. If that is true, and it probably is ... it blows Dale Sr's alibi for his son out of the water. "He was here the whole time she was supposed to be missing." Or words to that effect. From the report, it sounds like she was called to the scene of the divers' search at OBT and Jordan Ave area. Rather than the ATV search at Econlockhatchee. @Farris_TN Just near the FL Mall, that is all I know. @Farris_TN I have a friend that lives in the neighborhood where this is happening. @RunningThisLife Where are you getting this info? #breakingnews Property records confirm canal search re #missingmom #Michelleparker taking place behind house owned by #DaleSmith father. And imo, this is when the hummer was moved to it's final destination. Thank you Muffy. I have no idea why the whole link didn't show bc I highlighted the entire thing then cut & pasted. Muffy In our excitement we are causing you extra work. I'm so sorry for that. I did learn how to link the photos from your correction of my post awhile back. Thank you for all you do here at Scared Monkeys. Well, that has to be another search then! His house is not that close to OBT and Jordan Ave, where they reported the canal search was. Good grief, three searches going on today? 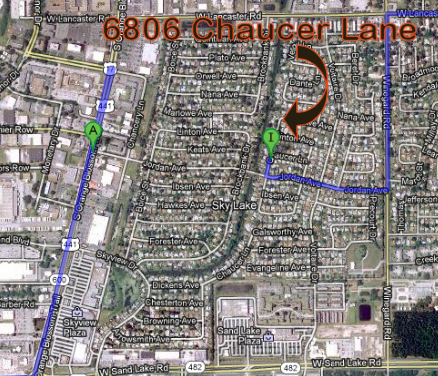 He owns property on Chaucer! Page created in 2.144 seconds with 20 queries.